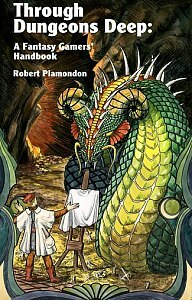 Chapter 1: What Are Fantasy Role-Playing Games? Remember this from English Lit.? As the men were sleeping, the monster burst into the hall. It seized a man, sank fangs into his throat, and drank blood until there was no more. Then, it began taking huge bites from the still-warm flesh. Not satisfied, it looked around for another victim and spied a large man in a nearby bed. It reached down its hand to seize him but the man was not asleep. He took hold of the arm and grappled with the monster. This man was stronger than anything it had ever faced before. Fear entered the monster's heart and it tried to pull away, to bite him, or rake him with its claws--anything to escape the awful grip. The man avoided the attacks and concentrated on his hold on the arm, bending and twisting until the monster bellowed in agony. The other men woke. They seized their swords and attacked the monster as best they could but their blades bounced off its horrible skin. Ancient spells protected the monster from the cold bite of iron. Slowly the hero tightened his grip and, finally, the monster's shoulder burst, and the arm was ripped from its socket. Mortally wounded, the monster fled screaming into the night. It would never kill another man. Beowulf had slain Grendel. This is the famous scene from the Medieval verse epic Beowulf. But the action could just as easily have taken place in a novel, a movie, an opera, or a play. Or, it could have taken place in a fantasy role-playing game. What are fantasy role-playing games? Answering that question was one of the most difficult problems in writing this book because fantasy role-playing games are similar to so many things, but different from all of them. Have you ever wished you could be projected into the middle of a movie and take part in the action? Role-playing games let you do just that. Have you ever read a book and wished you could create stories of heroic deeds? That is the bread and butter of a fantasy role-playing game. Do you remember the fun of childhood games of make believe? The excitement of playing Cowboys and Indians? Do you wish you could find a game that didn't bore you after five plays? Search no farther; fantasy role-playing games are what you're looking for. A fantasy role-playing game (which I will also refer to as a "fantasy game," "role-playing game," or just "game") is a game where people assume roles of fictitious persons. To put it less pompously, they make believe they are someone else. It's play-acting, but structured play-acting with rules to make the game more meaningful and more enjoyable. A player might choose to play some strong but stupid warrior named Harald Bentnose. He gets to decide what Harald is like--what kind of beer he drinks, whether he kicks his dog, goes to church, or respects the King. The player is an actor, but he gets to make up his own role. Sitting around and talking about your character is not what role-playing games are all about. The players need to have something to do with their characters. To accomplish this, one player, known as the referee, Dungeon Master (DM), Game Master (GM), or Judge, is put in charge of the game and is expected to come up with interesting things to do. The players then sit around and talk about what their characters are doing. I'll use Dungeon Master, or DM. The Dungeon Master prepares by blocking out some kind of adventure. For instance, he can draw a floor plan of a ruined castle, note where some horrible monsters have taken up residence, and suggest that the players' characters (known, surprisingly enough, as the player characters) go on a monster hunt. The make-believe world created by the DM is known as the campaign world and the adventures of the characters are the campaign. On the monster hunt, the DM referees the actions of the characters. How long does it take to go from wherever they are to the castle? The Dungeon Master decides. How do the players know what their characters see? The Dungeon Master tells them. Who decides what the monsters are doing? The Dungeon Master. The players decide what their characters are doing and the Dungeon Master determines whether or not it works, how long it takes, how much it costs, and all the other details. If the game were supposed to be a contest between the DM and the players, the DM would win every time because he holds all the cards. But that is not what is happening. A fantasy game isn't played so that a single character wins. No one is trying to beat the others. The idea is to have a good time facing challenges and, hopefully, overcoming them--all as a group effort. Everyone works together. In many ways, the players are acting the roles of the heroes in a play and the DM plays everyone else, both friend and foe. The idea isn't to outdo the other heroes, but to bring the story to a happy ending. The DM contributes to this process; he throws in the troubles that must be overcome but he also leaves opportunities to overcome them. He is neither forcing the characters to win or abandoning them to die. He puts them in a situation that, with skill, can be used to the players' advantage. On the other hand, it can lead to disaster if they fail. There is no way to "win" a role-playing game in any final sense. The characters can become fabulously wealthy and powerful or they can die, but neither event means that the player is a winner or a loser. The game itself never ends though it often stops. Each playing session leads to another. For example, suppose the players manage to kill all the monsters in the old castle. What are they going to do with the castle? They may choose to fix it up and become the lords and protectors of the immediate area--and collect taxes, of course. The next time the players get together, or the next six times, could be devoted to fixing the castle, fighting off new beasties, and wresting taxes out of the local peasants. If the players decided that their characters weren't interested in a moldy old castle, they would do something else. The Dungeon Master controls the world but he doesn't control the player characters. The players alone decide what their characters do. Since players play the parts of people living in the Dungeon Master's "world," they try to make decisions as if that world were real. The Dungeon Master's main job is to make his campaign world seem to be real by making things behave as one would expect them to behave. All of this is done sitting around a table, using verbal description and imagination to describe what is going on. But what about the rules? Role-playing games have rules, like every other game, but there's a difference. In a role-playing game you are trying to make-believe you are a character in another world. Interacting with that world, playing the part, and being involved with the stories that come out of it are what make the game enjoyable. The rules are there to help you do this. Since you can't "win the game," the rules can be fairly loose, leaving room for change. In fact, many of the more experienced Dungeon Masters don't really need rules at all. They know how far a horse can travel in a day and can referee a fight between a cave bear and an armored knight without reference to any rule; they just wing it. Now, I don't do it that way and no one who doesn't have a lot of experience should try it, but it does illustrate the point that rules are much less important in a role-playing game than they are in other games. There are more important things than rules, especially role playing, a good story line, a realistic campaign world, and a skillful Dungeon Master, not necessarily in that order. As a matter of fact, the secondary importance of rules is what allowed this book to be published. Good role-playing technique is the same no matter which of the dozen or more role-playing games you are using. Therefore, this book applies to every game. Playing a role is fun but it has previously been assumed that make believe is for children. Role-playing games are games of make believe that can be enjoyed by adults. A good role-playing campaign is amazingly realistic--a person can play without the slightest knowledge of the rules. He simply has his character do whatever seems best according to what's happening in the Dungeon Master's world. All he has to do is make believe that it's real and have his character react accordingly. A description of what the characters do in the campaign sounds like the script from an Errol Flynn movie. The characters gallivant around making friends, slaying enemies, and accumulating wealth and power. The games have the excitement of a good fight scene, the audience participation of a play, and the swashbuckling story line of a pirate movie. Unlike other games, role-playing games are open ended. The characters can kill dragons, save nations, build bridges, pick pockets, run an inn, or paint wallpaper. The possibilities are endless, limited only to the imagination of the players and the Dungeon Master. The characters can hunt big game one week, rescue a friend from prison the next, and solve a murder mystery the week after that. The variety possible in role-playing games keeps them from getting dull. These advantages make role-playing games very interesting and very enjoyable. Along with everything else that is interesting and enjoyable, role-playing games have their critics. It seems that role-playing games are destined to join television, pinball, and presweetened breakfast cereals as Great American Scapegoats. If you are looking at this book because you want to find out about the "darker side" of role-playing games you are in for a disappointment. The "darker side" is hype. Nobody plays role-playing games in steam tunnels or goes nuts and believes he's a Medieval hero. Sorry. The people who believe that role-playing games are for unstable geniuses going off the deep end have been conned. The ones who proclaim that role-playing games show "Satanic influences" are as credible as anyone else who uses the favorite lines of the Ayatollah Khomeini. Role-playing games are engrossing and sometimes thrilling, but they are no replacement for life and no one believes that they are. Perhaps some of the bad press comes from the phrase "fantasy role-playing." In recent years, fantasy has become almost synonymous with "sexual fantasy," and role playing is associated with psychiatric role-playing therapy--so it sounds like a game for crazy perverts. There are two distinct types of players: the Dungeon Master and everybody else. The everybody elses are called "the players." This implies that the DM isn't a player. He is, more so than anyone, as you will see in the following descriptions. The DM is in charge of creating the campaign world which gives the player characters somewhere to live. He creates all the inhabitants of this world, with the sole exception of the player characters. The DM plays all the monsters and all the people except the player characters. He decides what the weather is like. He adjudicates combat. He does everything--almost. How does he do all this? How does he make all these decisions? A lot of this book was written to answer those questions, but for now let it go at this: the DM sets things up as he likes them--but, for events that could hurt the player characters, he rolls dice. Dice are always present in role-playing games. In combat, determining whether you hit an opponent with your sword is done by rolling dice. The result of his return blow is done the same way. The world is not completely predictable and this is reflected in role-playing campaigns by the use of dice at crucial times. The players don't design worlds or monsters. Each player has a character and is in charge of playing him in character, making decisions, and doing things according to what is going on in the game. It sounds like the DM does all the work and the players are just along for the ride. This isn't true. Playing a character well can easily engage your full attention. The players are busy when they play their characters. The DM has enough things to do so that he can't outguess the players. They can scheme all the time, but the DM's attention is divided between all his various tasks. The result is that the players almost always do better than the DM expected. Players have time to be sneaky. My experience is that playing is more fun but DMing is more interesting. Both roles are entertaining and I'm not sure which role gives me more pleasure in the long run, though some people have a strong preference for one or the other. What are role-playing games? They're a structured exercise in make believe. The next chapter takes a look at this structure and gives some information that will help you get started as a role player. Fantasy role-playing games are not played in caves or steam tunnels, regardless of what the news media says. Like other games, they are played on a table or on the floor, typically in the Dungeon Master's living room. An unusual feature is that the Dungeon Master has a lot of material that the other players aren't supposed to see, so he tends to screen his end of the table from view or work from a different table. This preserves the DM's secrets until the time comes to spring them on the unsuspecting characters. There is a general procedure that novice players go through when joining a group of gamers. Before the expedition can begin, the new player must acquire a player character. The new character must have physical characteristics and possessions defined before he can be played. To give a random set of attributes, the physical characteristics are generated by rolling dice. (This will be discussed in greater detail in Chapter 3.) The character starts with a small amount of money with which to equip himself. All of the information on the character's abilities and possessions has to be put down in writing, usually by filling out a printed character record sheet. With this bookkeeping done, the new player is ready to begin. The Dungeon Master then explains the essentials of his campaign to the new players. All of the players should be introduced to each other and all of the characters should be described to the players. This lets the new player know something about the characters with whom his character is associating. When the adventure begins, the Dungeon Master will explain where the characters are and what is going on around them. In a continuing campaign, the experienced players will already know most of this information since the DM's narration will begin where play stopped last time. Relevant information such as the weather, the political situation, and offers of employment will be given to the players. The players, having been brought up to date, will begin to plan their next actions. The Dungeon Master is in charge of his entire fantasy universe, including the player characters. The DM can tell a player that his character is unable to invent dynamite, for example, because the character lacks the background necessary for developing such an idea. A good DM, however, will leave the player characters to the players as much as possible. When a DM starts meddling in other people's role playing, the players are justifiably angered. A player character is supposed to belong to the player and the Dungeon Master should interfere only when the player is having his character do something clearly impossible according to the structure of the fantasy world. All of the creatures encountered by the players are referred to as either monsters--the creatures encountered in hostile territory, some of which are human--and nonplayer characters, or NPCs--the creatures that the characters deal with in social (noncombat) situations. Both monsters and NPCs are run by the Dungeon Master. Since the DM is in charge of the details of his fantasy world, he is required to narrate events as they occur and to referee the actions of the player characters among themselves, and their interactions with the other creatures in the fantasy campaign. A role-playing game involves a lot of verbal description by the Dungeon Master. In some campaigns, no other props are used. The DM describes what the characters see and the players describe what their characters do. If they feel that it is important, the players may make notes and draw maps but, then again, they may not. As an example of this style of play, let's look at some dialog in a campaign with a Dungeon Master and three player characters, a human, a dwarf, and a Hobbit. The Hobbit is a safecracker and cat burglar and wears no armor; the others are warriors and have armor and shields. The adventurers have just finished looting the tower of an evil wizard who was conveniently absent. They had a tough fight with the wizard's household guards and all are slightly wounded and more than a bit tired. DM: About two miles from town, just before you leave the forest, a man jumps out ahead of you and says, "Stand and deliver!" He gestures to two bowmen, who step out from behind the trees and aim drawn bows at you. Dwarf Player: What kind of bow? DM: Short bow--not very powerful. Human Player: Osric says, "Alright, alright, already. How much?" DM: The bandit says, "Everything." Dwarf Player: Webli snorts and says, "We could take you before those puny arrows could get us. I'll give you fifty sovereigns to spare us the inconvenience." Human Player. Osric says, "Look, we're tired, and we don't want to kill any more scum today, so here's what we'll do. We got a little goody today that you'll find very useful." Osric pulls out his pouch and walks toward the bandit. He says, "I don't go in much for magic myself, so I'll let you have it." He starts untying the draw- string, but pretends it won't come undone. What are the bandits doing? Hobbit Player: Fuzzfoot will now sneak into the forest and circle around the bandits. DM: (After rolling a couple of dice) He gets into the forest. Nobody but the Dwarf notices. Human Player: I'll take out the ring and say, "Using this is kind of tricky. First, take a look at this ring. Notice the inscription..." I'm gonna B.S. like that for as long as I can. DM: (After rolling still more dice) When the Hobbit is about 20 feet behind him, the bandit leader says, "Get on with it!" Dwarf Player: To keep them interested, Webli shouts, "Don't show it to him, Osric! You know how valuable it is!" How's the Hobbit doing? DM: (To the Hobbit Player) What are you going to do? Hobbit Player: Sneak up and hold a knife against the leader's kidney and tell him to keep his buddies peaceful. DM: (After two last dice rolls--one to see if the Hobbit's approach is detected, and another to determine the bandit's reaction) He doesn't hear you come up. When you touch him with the knife he jumps about a foot in the air, starts to turn, decides against it, and freezes. After you tell him what to do, he orders his men to drop their weapons. They do it. Fuzz-foot strikes again. They're all meek as can be. What do you do now? Dwarf Player: How about making them tell us where their hideout is? Hobbit Player: How about not? Let's get them into town and collect the bounty for live bandits. I can't take any more wounds. Human Player. Neither can I. OK, we're taking them into town. This example showed several things. One is that the player characters never once made a decision based on game rules; their actions were based on the situation described to them, their knowledge of their comrades, and common sense. This is what makes role-playing games feel so realistic. The Dungeon Master, on the other hand, had to use his dice several times. The bandit leader was being conned and there was a chance that he would wise up or hear the Hobbit. The DM assigned a percentage chance for this and rolled the dice to see whether he would make it. He didn't and the Hobbit caught him by surprise. Speaking in Character. The players and the DM talk both in and out of character. Sometimes the players refer to their characters in the third person, sometimes in the first--Osric was either "him" or "me". There has been some debate over which pronoun is most appropriate, but I have no opinion on the matter and mix first and third person references indiscriminately, as do most of the people I play with. Using Props. Narration is easier when the Dungeon Master uses props, such as miniature figures, rather than relying solely on verbal description. Miniatures for role-playing games are usually inch-tall lead figures of adventurers and monsters painted by their owners. However, chessmen, pieces of cardboard, or any other convenient objects can be used. These figures are used to show the relative positions of the adventurers. If the DM has a surface he can draw on, such as large sheets of paper, he can draw in the terrain and the figures can be placed in their positions. This allows everyone to have a better picture of what is going on and stifles arguments over just where in the room a player character is or who is hiding behind whom. This technique is possible with any game counter that lets the players tell each other's figures apart, but the lead figures are much more impressive and informative than improvised counters. When the Dungeon Master places a figure on the board that is nine times taller than the character's figures, everybody knows they're in deep trouble. The problem of players wailing, "But I didn't know it was 80 feet long!" disappears when the DM has a complete selection of monster figures--everyone can see for himself. Unfortunately, the DM can become very poor this way. A complete bestiary is expensive. Kind DMs will have figures to loan to novices, although many are too poor to have any extras or value their paint jobs too much to let others handle them. I have always thought that players should have figures of their own for each of their major characters since there is a strong identification between the character and the figure used to represent him. The players characters are usually confronted with a distinct goal, and the playing session is devoted to working toward it as best the players can. The Dungeon Master, in his role of impartial (more or less) referee, will be providing both obstacles and assistance to the player characters, according to what they do, whom they encounter, and how the dice roll. The expedition may not be finished when it becomes time to quit, so the players and the Dungeon Master make a few notes about what was going on and pack everything away until next time. Some campaigns last for months of weekend play before the players achieve their goal. In others, the goal is reached in a matter of hours. A typical game session is long--most are at least four hours long and "all-nighters" are common, at least on college campuses. The players will meet people, travel, and probably fight. Combat is essential to fantasy games. It adds excitement, danger, and a chance for heroism. Many campaigns deal with combat almost to the exclusion of role playing. This is going too far, however, since much of the excitement comes from the involvement of the players with their characters. Combat rules take up a large portion of any role-playing game's rule book. This is due to the fact that the players will not settle for the same kind of free-form refereeing that they get when their characters are buying ale in a tavern. When the player characters are in deadly danger, the players want well-defined rules to keep them from croaking on the whim of the Dungeon Master. Thus, the combat rules tend to be complex; the action is divided into small units; there are rules for who strikes first, how many blows can be dealt, and detailed tables showing the effects of all kinds of weapons and armor. Everyone wants both perfect accuracy and great simplicity and, so far, no one has been able to produce both at the same time. The main features of combat are movement, where the players move their characters and the DM moves everyone else, and the exchange of blows. Once the combatants are in a position to beat on one another, dice are rolled to see if anyone scored a hit and again to determine the damage done. There may be several dice rolled in the more complex systems to determine where the blow landed and whether it was a "critical hit" that disables the opponent or a light wound that allows him to continue fighting. Combat can end when one side is wiped out or surrenders, or the losers may just run away. Sometimes a truce is worked out in the middle of a fight when both sides decide that they are getting nowhere. Player characters rarely surrender unless they know that their captors will hold them for ransom and that the ransom will be paid. Otherwise, the fate of a captive is slavery or death. Nobody wants to play in an adventure where they are a helpless slave, so the players would rather have their characters die gloriously. In addition to traveling and fighting, the players are faced with problems of supply, getting loot back home, negotiating with monsters, buying goods from greedy shopkeepers, and avoiding tax collectors. Although less thrilling than doing battle with dragons, these activities are interesting and fun and should not be neglected. Playing is more fun when you can pretend that your character is a real person in a real though strange world. It allows you to plot and plan because you have a background upon which to base your schemes. A good fantasy campaign has a lot of material for the characters to draw upon, which lets them develop more and more elaborate plans as they become familiar with the campaign. Characters also deal with each other and with the nonplayer characters. Characters can haggle with tavern keepers, bribe guards, plead with powerful monsters, and generally interact with the creatures around them. This puts the role-playing aspect of the game into high gear and gives everyone a chance to indulge in a bit of play acting, which is, after all, what role-playing games are all about. In a good campaign, there will be many opportunities for this sort of thing. Role playing is the thing that keeps these fantasy games alive, since a straight "hack and slash" game gets boring after a while--I've tried it and I know. If the game emphasizes role playing, there will be a tendency to analyze the situation as if it were real as opposed to being "just a game" with a rule structure you are supposed to exploit. This is analogous to the "willing suspension of disbelief' when reading a book; you think of the action as being real rather than being something that has to be wrapped up soon because there are only 30 pages to go. The mechanics are intentionally ignored so you can enjoy the story. The difference is that you are helping to make the story yourself. Few things are more frustrating than finding a great game and having no one to play it with. With fantasy role-playing games, the problem is even worse than usual since someone has to be the Dungeon Master and being a DM is much more difficult than playing, especially for novices. Thus, it is a good idea to learn to play in an established campaign where the DM and most of the players already understand the rules. Although it is perfectly practical to learn to play on your own, it is more confusing that way. The best way to learn about role-playing games is to play them, and the easiest way to start is in a campaign where the players can lean on the expertise of the DM. Finding such a game can be difficult. Hobby stores that sell role-playing games often have game announcements posted on a bulletin board. Calling the DM who posted the notice will usually get you into a game. Some stores sponsor gaming clubs or game tournaments; if these include role players, you can probably find a friendly soul who will let you play. If all else fails, you can collar people coming out of the hobby store and generally ask everyone you meet if they know of any active campaigns. I know several people who got started in role playing because they introduced themselves to a person carrying a rule book. The best campaign to start in is one with low-level player characters and an experienced DM. High-level characters (i.e., characters with lots of experience and magic) are confusing until you learn about high-level spells and special powers and have a good grip on what the more powerful monsters can do. Unless you are overwhelmed with free time, don't pick a campaign that meets too often. Once a week is about as much as most students and working stiffs can afford. If the campaign meets too often, you'll either spend more time than you can afford or miss a lot of expeditions. This is frustrating, especially when you show up to find that your character is far poorer than everyone else, or dead. Try to avoid campaigns where the DM kills all of the player characters every time (the killer campaign) or runs a treasure giveaway show (the "Monty Haul" campaign). These campaigns are useless for anything except a bad example. If nothing turns up, you can start your own campaign, assuming you know some other novices who want to play. Although more difficult than starting with an experienced DM, it isn't a particularly painful experience and the section on refereeing in this book will help make it easier. The main problem is in wrestling with all of the unfamiliar rules but, after a couple of gaming sessions, everything tends to straighten out. When I first started playing fantasy games we had a series of incredibly bungled campaigns, teeming with misinterpreted rules, arguments, and general confusion. We had a lot of fun anyway. The first games you play tend to be very exciting; partly because you don't really know what's going on. Later, a certain worldliness tends to set in and the excitement can wither when experience makes every danger familiar. Many would-be players have the bad fortune of being unable to find anyone to play with. An option open to these people is the solitaire adventure. Solitaire adventures are designed to take the place of the Dungeon Master. In a typical solitaire dungeon, you start at the entrance and have several options as to what you can do. A typical entry in the solitaire dungeon book would be, "Dungeon Entrance. There is a long corridor going North, another heading East. To go North, go to 57; to go East, go to 63; to leave go to 125." The player then chooses an option and turns to the paragraph indicated in the book to read what happens next. A solitaire adventure is better than nothing, but is necessarily less entertaining than a good live adventure where there are other people to interact with, a clever Dungeon Master to keep things interesting, and opportunities for creativity. The worst flaw of a solo adventure is the limited number of options presented in each situation; you can't do anything that the author hasn't thought of first.